I've always loved ginger ale. 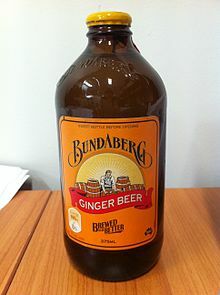 It's been my comfort drink since I was a kid when my Mom would pour me an ice cold one any time I whimpered about a belly ache(and don't tell her but I sometimes faked it just so she would bring the good stuff home) But it wasn't until a trip to Australia with my sisters that I discovered the joys of Ginger Beer! On an outing with friends one night, I wasn't in the mood for boozing it up so one of my trusty Aussies offered up a ginger beer. At first I thought it must be the same thing as ginger ale but they just call it by a different name but then this friend was quick to correct me. "Noooo, this is totally different and I guarantee you'll like it more! I can't believe you've never had ginger beer!" And he was right. It was love at first sip. When I got back to the states I went on a hunt for my newly found bliss but it was 2008 and it was a rare commodity. Then I thought, well maybe I can just brew my own and here we are today. Now you can find the stuff everywhere as it's become a thing at your local trendy bar but I think brewing it yourself ads to the cool factor and will absolutely impress your friends. So give it a go!